Ten Speed Press, 9781607747369, 272pp. John Currence opened City Grocery in Oxford, Mississippi in 1992. Since then, the City Grocery Restaurant Group has opened a number of restaurants, including Ajax Diner, Nacho Mama’s, Kalo’s Tavern, Big Bad Breakfast, Bouré, Lamar Lounge, The Main Event, and Snackbar. Currence is the recipient of the 2009 James Beard Award for Best Chef South and the Southern Foodways Alliance Guardian of the Tradition Award. He has appeared on television programs such as Parts Unknown, Mind of a Chef, Bizarre Foods, Treme, and Top Chef Masters and his writing has appeared in Food & Wine and Bon Appétit, among many others. He is a contributing editor for Garden & Gun magazine, a board member of No Kid Hungry (a project dedicated to eradicating childhood hunger in the United States), and an organizer and past board member of the prestigious annual Southern Foodways Symposium. 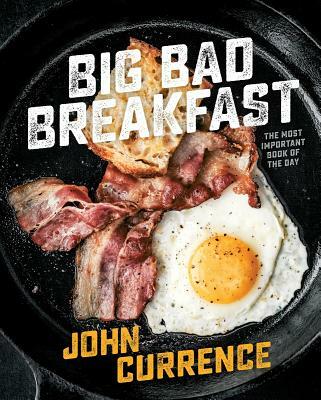 "Chef-ruler of Oxford, Mississippi, John Currence is here to make the case for breakfast. With recipes from the restaurant that gives this book its title, Big Bad Breakfast offers a vision of mornings spent with Southern heavyweights like oyster pot pie and banana-pecan coffee cake. If you love Eater's Breakfast Week, biscuits, the idea of cinnamon rolls baked with sausage filling, and/or restaurant cookbooks that actually seem cookable, this one's for you." "If you’re the sort of person who gravitates toward diners, whose favorite restaurants serve breakfast all day (we are not talking about McDonald’s), who makes breakfast for dinner at home and whose idea of a good time is making frosted flakes from scratch, then here’s a cookbook for you. Big Bad Breakfast is the new book from John Currence, and it’s a big, bad book of a cookbook. . . . Ed Anderson’s hunger-inducing photography includes repeating plates of pancakes, lots of cast-iron skillets and eggs in various compositions, pouring coffee, Elvis Presley tapestries, biscuit step-by-steps, shots of a baseball-hatted Currence at work in the kitchen or bellied up to a crowded counter. Flip through all this, read the chatty anecdotes (in praise of MSG, the emu egg in the parking lot), and the handy tips from someone who’s worked in many kitchens, both other people’s and his own, and you get a growing sense of comfort — and that’s not just because many of the recipes are for comfort food." "This is a book that earns a spot on your shelf. It is a cookbook of substance, put together with care. Currence has things to teach us: the amount of knowledge on eggs alone is worth the price of the book, ditto the biscuits."